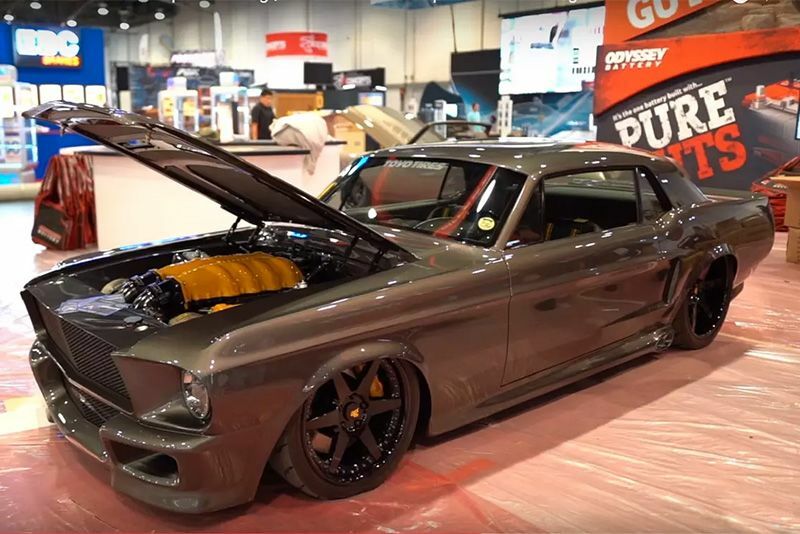 This build will probably divide opinions but we don't care because this dude put a Ferrari engine in a '68 Ford Mustang – on purpose. The SEMA show in Las Vegas is the premier trade show for speciality automotive products and, as such, the vehicles you see there are often sublime. This year was no disappointment, with some truly spectacular builds, but this one takes the cake. Yup, a chap called Tony decided to put a Ferrari engine into a classic Ford Mustang. The 1968 Ford Mustang called "Corruptt" has been owned by Tony for the last 14 years but, due to circumstance, hadn't been worked on in over a decade. Until last year, that is, when he rolled it into his shop and decided to do something different. That's when he found a working 4.2 litre F136 V8 from a Ferrari F430. There were some mechanical modifications that needed to take place to fit a mid-mounted engine from a supercar into the engine bay of a classic America muscle car. For instance, an intake manifold from a Ferrari California with custom injectors replaced the original item and the small matter of the T4 twin-turbos from Nelson Racing Engines. It's also received a Tremec T56 six-speed transmission with a sequential shifter to turn the rear wheels as well as Ride Tech Shockwave air ride suspension all around. Although boost on the turbos has been kept to a minimum before they test for official figures, the Corruptt is estimated to pump out around 700 horses. Looking around the car and the attention to detail to the aesthetic modifications is incredible. The roof has been chopped by 2.5 inches but they've managed to keep the shape and proportions just right. This proportionality is kept in check by the two-inch extended boot while the front overhang has been reduced by two inches. There are custom dual side-exit exhausts and custom acrylic bumpers, with Avant F461 wheels rounding off the exterior. Inside, you'll find a carbon fibre floor pan and some 3D printed parts, some wrapped in carbon fibre too, and the entire thing is operated via an app on Tony's iPad. Yup, you can open the doors and wind down the windows, start up the engine and operate the lights without having to be within proximity of the car itself. Ahhh, technology, eh?